I feel like I've been whining and moaning and enumerating the reasons why I can't move forward, so I decided to try listing some actions that I could take to grow Fine Mess Pottery. In the interest of brainstorming, I am not going to censor my list as to whether these are good or effective uses of my time; only looking for ideas that have the advantage of being possible for me to accomplish right now. One thing seems clear; I need to make more stuff. Simple as that. If all of my inventory is out or sold, I won't have any with which to respond to new opportunities, and no sense of pressure to create new opportunities. My studio work is being de-prioritized behind errands and housecleaning, whereas I would never call in sick to my PT job because the rugs needed vacuumed. I am neat, but not a freak; I can tolerate my house being a little messier. I think. Since I spend so much time online anyway, I could find a way to channel some of that into FMP. I have an Etsy page, for example; I just never use it. I also have a retail site. I could easily build a wholesale site to make ordering easy. Just BTW, would any readers like to share their Etsy experiences? While it's true that consignment is not going to be the whole answer, I am probably not maxed out on consignment in my area yet; and new consignment outlets are relatively easy to obtain. I hate to do it but some pruning is probably also in order: I need to pull my work from a couple of places where it's gathering dust. 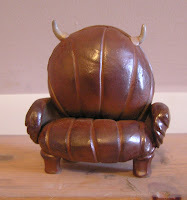 Here's a very concrete goal: six (successful) sculptural pieces by March, to approach galleries - I have three in mind. I'll need a dozen or more for the exhibit. Okay - it's a start. 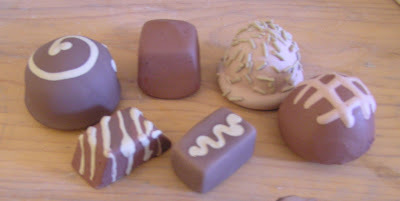 I spent mine making ceramic chocolates, something I've sort of wanted to do for a while. It was pretty spontaneous, so I just used what I had around for the slips. These are still green; we'll wait and see how the surfaces turn out after firing. Assuming I get my act together (assuming I even want to) and spend more time making pots, in which direction would I like to grow my business? One option is to return to doing art fairs, either wholesale or retail or both. I always liked doing the fairs, and only stopped when I had no studio after my divorce and had to get a job. Also, I thought I was getting a bit old for all that schlepping. It's no fun alone. Now I have a studio, my so-called "job" is flexible enough, and I have a willing beast of burden in my dear hubby, but I haven't gone back to the circuit because of the hurdles: I lack a van or truck; I'd need to build a new booth display ($$); and the hundreds of dollars in application fees, and thousands of dollars in booth fees, that I'd have to have before I sold a single mug. Doing fairs from a St. Paul-based studio is a much easier proposition to begin with, as there are probably 20 top shelf shows within a short day's travel from the Cities; there are approximately two that are so accessible from Augusta, Maine. Add to that, this year I really really need to rebuild my kiln, and it begins to seem out of reach for now. Of course, that's the conclusion I always reach, which is why I am still not doing art fairs, despite that we'd both enjoy it. It may be that it won't happen until we just decide that it is happening, whatever it takes. And start mapping out what it will take. I do know that I don't care to do rinky-dink fairs, ever again: they are no less work than the good fairs, with a lot less return. I haven't applied for St. Louis or the Uptown for years, and my work has changed alot. Maybe I couldn't get in anymore. One circuit I won't be applying to is the American Craft Council -- I've lost my regard for that organization, which seems to have squeezed out small studios in favor of big production shops. They won't be getting my $2000 booth fees. Of course, it's only one option, or it might be part of a multipronged stategy. I still have some other ideas to consider. I get up quite early, between 5 and 6 am. I feed the critters, make coffee, do any dishes that have accumulated in the sink, and head upstairs to the office to check my email. Hubby is still asleep. Here's where things bog down a little. While I drink my coffee, I'll check the email at several addresses, read several news sites, and my favorite blogs. This can take over an hour. Who am I kidding? This sometimes takes two hours, or more. Breakfast, bath and dress. Take the dog for a walk. 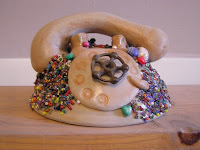 Call my mom, or my mother-in-law, or any friend I haven't talked to in a while. 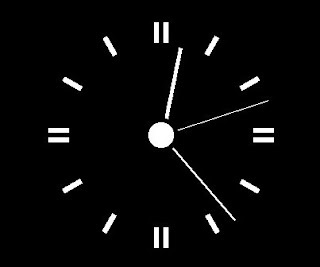 By now it's, say, 9:30. More coffee, check email, write To Do List. The list always includes what I call the Home Blessing (thanks, FlyLady! ), 15 or 60 minutes of cleaning the house, depending on the day. Some days that can go longer, if I've had to skip a few. There are usually some errands on the list, like grocery shopping or going to the Post Office. This season there are lots more errands, what with shopping, sending cards, and so on. If it's nearby, I'll walk, and bring the dog. That makes it take longer, of course, but it's better for me and Qq definitely needs the excercise. Lunchtime! Also time for a break. I'll usually sit and read for a while in the early afternoon. Now hubby is up and we spend some time together before he begins his workday. Now it's around 1:30 or two. If I have pots to price or pack, or invoices to print, or studio bills to pay, I'll probably do it now. By three I'm finally in the studio! I'll probably work an hour and a half or two before it's time to start dinner. After dinner, I might get back into the studio. Or hubby and I might take the dog out, or walk down to our local pub; or I might go to the gym. By eight or nine I am either online again, or reading my book, or we're watching a movie. This is a typical day only to the extent that I even have a "typical" day. Some days I will spend the whole day glazing, or tending the kiln; other days it's my turn to gallery-sit, or I have to go to my part-time gig, and teach a class in the evening, so I might not get into the studio at all. Nevertheless, this exercise has been very helpful! It seems part of my problem is a very leisurely approach to time management. It's a nice way to live, though -- do I want to change it? I guess that's the next question to tackle. I’m still sort of thinking out loud (virtually thinking?) about why I seem to be spinning my wheels professionally. Actually, that probably isn’t fair – my work has improved, and continues to do so. It’s the business end of things which seems to be caught in a road rut. It all comes down to money. A good friend of mine, whom I’ll call Mr. Business Guy, had some thoughts on the matter. (As an aside, how odd it is to see one’s college buddies grow up! I used to have bottle-rocket wars with this guy; now he’s somebody’s CEO.) He pointed out that I always have exactly as much money as I need. There’s some fluctuation, of course, but at the end of every month, I’m never seriously behind on anything, nor is ever there any significant amount to carry over into the next month or save (ha!). Mr. Business Guy observed that it is unlikely to be a coincidence that the income and expenses are always exactly the same. Whether I am aware of doing so or not, I am choosing how much money to make; which suggests that I could choose some other number… say, more. This makes a kind of sense. Somewhat analogously, I sell all the pots I make, with the obvious exceptions of firing failures, and a few painfully ugly, but necessary, experiments. Though I love making, I tend to do so when I have a particular reason: an order due, a show, an outlet needing work. Could I sell more if I could make more? Maybe. Could I make more than I do? I certainly could, without the inconvenient job, but not (immediately) enough more to make up the income. Could I make more without quitting the job? It seems like the answer should be yes, but somehow I don’t seem to have the time. What am I doing with all my time? That’s the question, and what I’ll tackle about next. This will consume more than one post, and truthfully, it happens more than once a year. 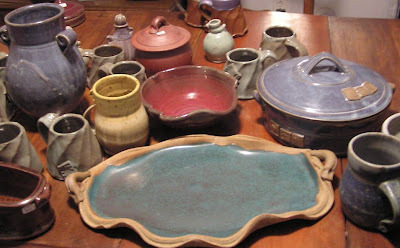 It goes kinda like this: until 2000, before my divorce and move to Maine, I was a full-time potter. I did wholesale and retail artfairs and taught a few classes a week. Since the move, I've been a part-time potter with a part-time job. It's not the worst job in the world, and in this economy God knows I am grateful to have it. Without it I wouldn't have been able to buy my home. Nevertheless, the idea when I got the job was that it would be temporary, until I could get my studio business going full steam again...and eight years later, that hasn't really happened. Lots of good things have happened: Bought a house and a gas kiln (such as it is), got married, my work has improved. But though I have a nice life, I am really no closer to being a full time potter than I was in 2000. < So I can't help but wonder if I am going about this wrongly. Right now I get my pottery income from private sales, a number of consignment outlets, and a couple of small wholesale account. Consignment is a fairly limited model, as I have found consigning outside of my immediate area to be unworkable. You either have to pay for shipping or (depending on where it is) take a day to deliver the work. If it isn't somewhere that you can visit periodically, they might not even have your work on the sales floor. And then you have to pay to have it shipped back if it doesn't sell. The checks are unpredictable, and you have to have thousands of dollars in inventory out in the world while you are waiting to get paid for it. 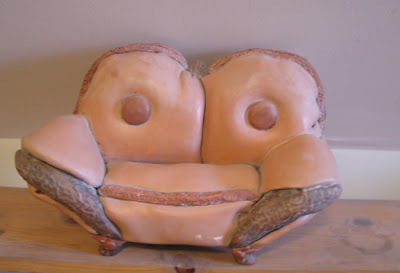 Add to that, I also have a body of sculptural work that I really never do anything with. I'd like to display it but I can't seem to get enough cash together to get it professionally photographed, and amass enough of the pieces to make a good show; or, really, scrape together the guts to approach a venue. I don't even know how. So, maybe that's a place to start: a specific goal: show this work. 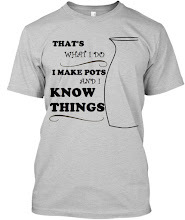 So much of what we do as potters isn't making pots. Packing, shipping, contacting sales outlets, travelling. 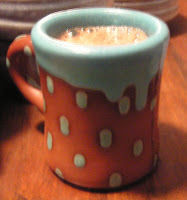 Tonight I was enjoying a cup of hot chocolate while pricing work for the Portland Pottery Show, opening on Thursday. Most of these are from my most recent firing. The firing was perfectly fine but glazes have lost my heart a bit since I started soda firing, I must admit. Still, good reds and celadons, I really can't complain. Just for fun, here's a shot of the Emily Loelhe mug, slipcast earthenware, from which I was enjoying my hot chocolate. It's less blurry in real life. Because of firing times and conflicts, we're firing stoneware rather than soda this weekend, so I get to use my Shinos. Above is the low cone pack: 012, 05, 3 & 6. 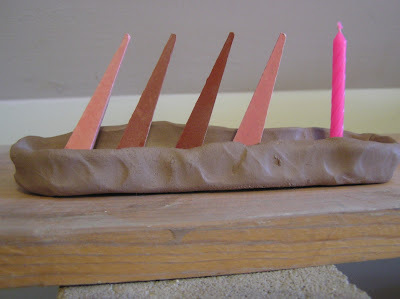 The birthday candle is so I can see the pack thru the spy while I am loading, and the kiln is still (obviously) cold and dark. 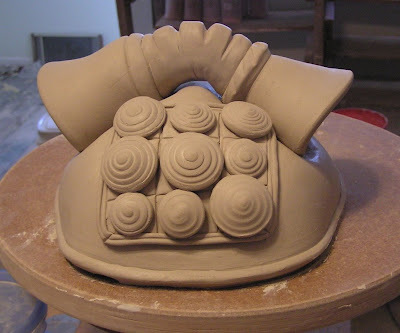 I'm all done glazing, I just have to spray-starch everything for transport, then wrap it up and drive it to the kiln. It’s Glaze week! Portland Pottery students are glazing all the work from this session in preparation for the Holiday Show and Sale, and then the year-end break. Adam, Kelly, Wil, and Karen are working like Santa’s Elves to squeeze through two glaze firings before the show opens on December 11th. Here’s Adam, loading. I look forward to the holiday break every year, although I miss my students, especially long-timers like Holly and my book-buddy Gail. Every year I swear I will devote the extra time to the studio…with mixed success. 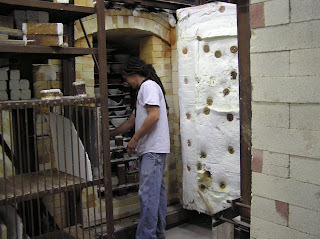 It’s glaze week here at Fine Mess Pottery, too, as Doug and I prepare to fire the soda kiln on Friday. Our work styles are so different: I plod along steadily, spending a couple hours in the studio everyday, until I have enough for a load. Doug starts working the week before the firing, and makes dozens of slab-built pots in several six or eight hour stretches. Lately he’s been working on square drinking tumblers, a simple, functional shape dressed up with a decorative medallion on the front. We’ll have the pots from this weekend’s firing at the PP show.